These wells are manually dug holes in the ground (using shovels, picks, etc.) with the exception of modern wells. They are generally not very deep (between 8 and 20 metres). Because they are so shallow, these wells are at higher risk for contamination. Populations that do not have access to surface water. It is an ancient technique. Evidence of wells have been found dating back to the Copper, Bronze and Iron ages (more than 3000 years ago) in many places throughout Europe. The earliest wells were simple holes that were not protected from cave-ins ; they did not stand the test of time and no trace of them remains today. 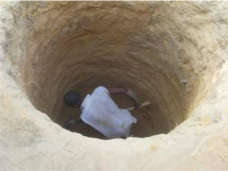 This is often the only relatively easy way to obtain water, particularly in developing countries that lack surface water. It is an economical technique because it only requires physical labour with simple tools. 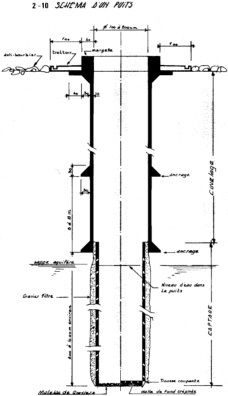 This is the simplest method of well construction. Populations living in poor regions and areas that do not have modern well-digging tools. - setting up the mechanism for abstraction : this is the part of the well that is below the level of the water table that allows water to enter the well. - installation of surface material to keep the well in good condition and preserve the quality of the water that comes from it. Traditional wells are a construction made by local populations with the means that they have at their disposal, sometimes with the help of professional well-diggers. These wells are dug by hand using very old methods, without concrete spouts, with walls only supported with wood or branches. These small wells are generally less than 10 m deep. They are constructed simply and quickly with a simple lining of branches or straw. They must be regularly reinforced because they can cave in. The depth of the water in them is generally shallow. The volume of water they supply is low. These wells are deeper (sometimes as deep as 10-20 metres or more) and are made by experienced well-diggers. Their diameter varies from between 0.8 and 1 m.
While the lifespan of wells like these is longer than for temporary wells, they may deteriorate significantly if the support for the well walls is not substantial enough. This type of well can be dug by partly hand but it is generally done with mechanical digging equipment. 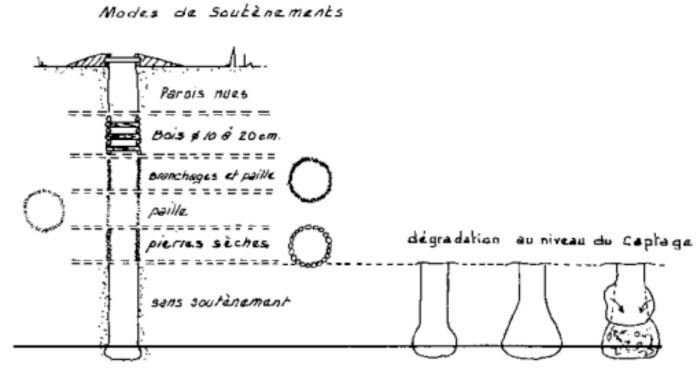 The diameter of these wells varies between 1 and 1.8 m. The walls are firmly supported by a metal or concrete casing, topped with a margelle (coping) and protected from animals. - In soft soil (sand, clay, soft schist) manual tools like shovels, picks and crow bars can be used. - In harder soil (sandstone, hard schist, etc.) a jackhammer is needed. - In very hard soil (granite, quartz) explosives can be used but this is an expensive and dangerous technique. In these situations, drilling is a better technique (see the file E 30 about drilled wells). There are multiple dangers (cave-ins, falling walls) when a well is dug by hand. A certain amount of knowledge, skills and understanding of the technique are absolutely necessary to ensure the safety of the people working on its construction. 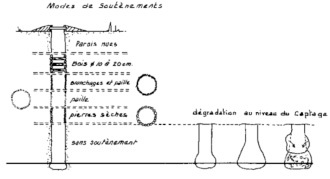 Wells dug this way have a wider diameter which means water can be drawn from a wider zone in the water table. These wells can capture water from less permeable materials such as fine sand, loam or clay. - most surface wells are not very deep and they are dug in permeable soil so they can quickly run dry in a drought or with a simple seasonal drop in the water table if it goes below the depth that the well reaches. Construction, operation and maintenance costs depend on the techniques and the pump system used. - Material used for the lining. - Any pump equipment necessary : hand pump or a motorised pump, many wells are only equipped with a pulley and a well bucket attached to a rope. These costs vary considerably depending on the materials used and their availability. As a general indication, in Africa, the construction cost for a traditional well is somewhere between 8 and 25 euros per metre in depth. The price of a hand pump can be quite high. It varies between €60 and €1500. (See the files on these pumps E35 and E43). If the soil is unsteady or too soft, do not dig a well, opt for the driven well technique with a casing (see file E 30 on driven wells). 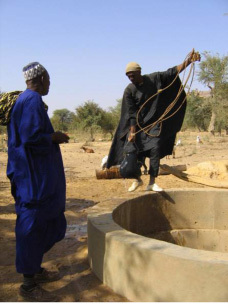 The NGO Via Sahel (based in Toulouse) has constructed some 60 wells in Mali (in Dogon Country) at the rate of about 15 a year. Their depth varies between 15 and 70 m and the average cost is around €1800. Every well provides good quality water for 300 people. The NGO supplied the cement, the iron reinforcement and two well-diggers that they had trained previously. The residents of the village agreed to help do part of the digging with picks during the 3 months of work. - CINAM Comité Interafricain d’Etudes hydrauliques, Interafrican Committee of Hydraulic Studies : « Manuel de formation des formateurs villageois - Le point d’eau au village » “Training manual for village trainers – the water source in the village” : set up, use, hygiene, maintenance. This manual includes several small booklets and cartoons intended to provide villagers with information on a number of subjects. 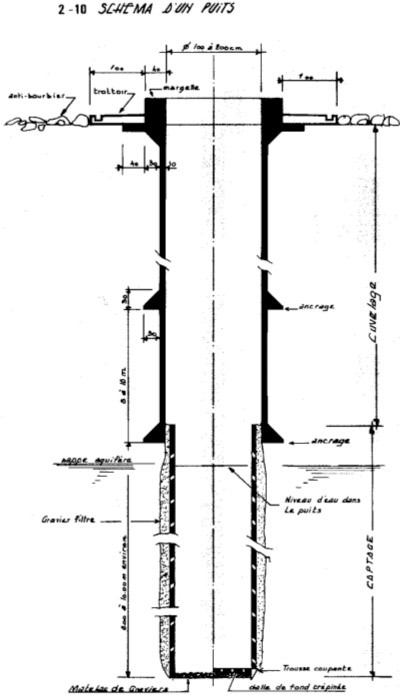 For information specifically about wells, look at the second booklet and particularly the illustrations 2.8 and 2.19. - RWSN- Fondation Suisse SKAT « Solutions vers la réduction du coût des puits en milieu rural africain » “Solutions to reduce the cost of wells in rural Africa” A 16-page report with lots of information and good illustrations about various types of wells and drilling, and the least expensive solutions from the Rural Water Supply Network.